Disney Theatrical Productions’ Aladdin is a whirlwind of colour, movement and music which is a night in the theatre that you will be hard pressed to top. I think I just discovered what it feels like to spend two and a half hours in a washing machine on the spin cycle full of sequins, glitter and a vast array of talent! 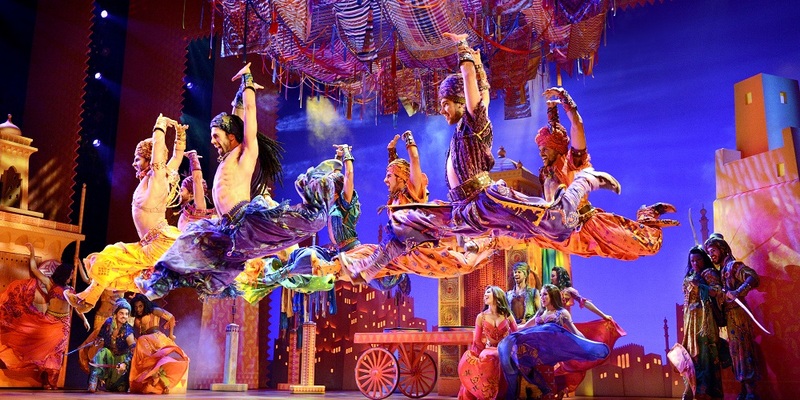 Disney Theatrical Productions’ Aladdin is a whirlwind of colour, movement and music which is a night in the theatre that you will be hard pressed to top. Disney has always been renowned for its commitment to excellence on screen and on stage and Aladdin is the culmination of the stage work of this vastly experienced company to date. From the minute the magic carpet front drop disappears and the first page of the pop-up book story appears revealing the Genie (the brilliant Gareth Jacobs), the story of Aladdin (the super attractive Graeme Isaako) materialises seamlessly out of the blank canvas of the stage. The stage morphs and transforms from moment to moment in a seamless transition from Genie’s space to the market place to a street scene, to the Sultan’s palace, to Aladdin’s rooftop home to a magic carpet ride, barely giving the audience a moment to draw breath – and we are only twenty minutes into the first half of this magic carpet ride that threatens to overload our sensibilities. Disney has the production standards we would expect from a 21st century piece of music theatre. We want to be enthralled, lifted out of our seats by spectacle, moved by the emotional journey of the artists on stage and Disney certainly know how to cast and stage a show and this stage full of Australian talent does this Broadway masterpiece great credit. The cynical response is to say it’s all schmaltz, but ask anyone who just witnessed this beautifully crafted, seamlessly performed, excellently sound reinforced, beautifully lit piece of theatre and they would all give you the response “brilliant”. You don’t get a standing ovation just before the end of act one unless you’ve earned it, and this cast earned it. I’m still tapping my feet and whistling the number! Where do you begin? The ensemble – wow. Acting, singing and dancing at the highest professional level and inspiring many a young performer to reach their capability. These men and women are at the peak of their physical and musical capabilities, there isn’t a moment when they are on stage that you are not in awe of their strength, talent and stamina. They are the backbone that the principals rely on to be able to give their all to this gigantic work. Forgive me ladies, an indulgence. I have seldom witnessed a better and more disciplined ensemble of male dancers, it’s unusual to see them so clearly featured notwithstanding the ladies’ ensemble are extraordinary as well. Rob Mallett (Kassin), Troy Sussman (Babkak) and Adam Di Martino (Omar) don’t miss a trick as Aladdin’s three stooge friends. The performances of these three men add life and excitement to every scene they are in, and their comic timing – excellent. Jasmine’s three attendants (sadly not credited) are a fun trio of pixie like energy that gave Jasmine the perfect place to play from. Darren Yap’s Sultan is a lesson in regal bearing, while the pairing of Doran Chester (Iago) and Adam Murphy (Jafar) is sheer brilliance. These two know how to work a crowd and each other and they threatened to steal the show. Adam Murphy is an object lesson in how to play a baddy and Doran Chester has the role of comic sycophant down to a fine art. However, Shubshri Kandiah (Jasmine), Gareth Jacobs (Genie) and Graeme Isaako (Aladdin) couldn’t, and wouldn’t let that happen. Brilliant staging, exceptional musical arrangements and a good old-fashioned dose of storytelling let these three characters shine throughout the night. Kandiah is a consummate performer. Her ease and grace shine through and she is luminous as the confident and beautiful Princess Jasmine. She is gifted with a perfect voice to sing the role and you can’t help loving this feisty young woman who is striving for her place in the world on her terms. Gareth Jacobs’ Genie is (in his own words) genius. This seriously talented young Australian had the audience in his hands from the word go. We loved him, travelled with him, shared his disappointment and revelled in the outcome of his story – not telling, you just have to go and see it! His exuberance was infectious, his energy unwavering and his ability awe inspiring. Just go see the production for this man’s performance alone and you won’t be disappointed. A show stopping opening night performance! Finally, Aladdin, Graeme Isaako. Isaako has truly made this role his own. It’s as if the role had been written for him. Bright, intelligent, emotionally truthful characterisation plus some pretty formidable singing and dancing skills, what more can I add – well it’s great to see the birth of another Australian superstar. Aladdin is a feel good show to share with others that is well worth the price of a ticket. We often hear the grumble that theatre tickets are expensive. If you get the chance to see this show you will see why every red cent is well spent. The costumes are extraordinary, the sets are magical and every new page of the storybook reveals a new and brilliantly conceived set. The sound design is beautiful and the voices and the orchestra are blended to exactly the right place. I almost forgot the orchestra. 15 brilliant musicians led by Brent Allan Huffman and the trumpets that open the show – goose bump time. Last, but by no means leas,t a brilliant Australian cast of world class performers. Aren’t we lucky, Adelaide! My final word – You ain’t never had fan like me! Glam Adelaide also had the opportunity to chat with the cast of Aladdin. Check out our interview here.